My first blog entry was not too long ago. I started writing (in 2004) as a past time whenever I am not listening to lectures or having a date with a thick medical text book. Plus the free access to the computer lab (oh uni days..). Basically the IT lab guy can already familiarize himself with the regular lab visitors. I would not say that writing keeps me going, or as another realm of ‘escapism’ as some would call it. Well, when you write and express yourself through writing, you are utilising the ‘outlet’ of spilling and sharing what you sense, perceive and comprehend. The reason of why you are doing so, is secondary. Before there was email, I used to write home. Boarding school did not allow students to bring handphones. Mine was with mum anyways, only given to me during school break. So, apart from calling home from the public phone (which I was an on-off regular), mum and I went for the pen and paper. We do exchange letters often 🙂 1996, to 1998 and 1999.. I was writing letters every other day. Either to mum, a few pen pals which I had that time, or my ex school/college mates. Memang kerja menulis surat je lah. Masa prep pon nak tulis surat. Dapat result SPM, BM dapat A2… mana tak frust.. haahaa.. anyways, those were the days.. If the head girl in school had the most letters in the mail box, I would be the 2nd top letters receiver. That’s where I normally stop by after class. To see if my letters have arrived 🙂 And every time it does, there’s a sense of satisfaction which keeps me wanting to write more and more. I am not an A class writer (as you can obviously see). But I just like to write, and communicate this way. Words spoken dies fast, though some of them are retained and remains as legacies in our brains, and memories. Words that affects emotions, are normally the ones which lasts. Words that you write and blog about, remains for all to see. Serves like an online diary sometimes, though I have yet to ‘compile’ what I’ve blabbered about these past 8 years.. I will be turning (ehem) 30 this coming August. If I were to look back (which I will definitely lah! ), I’ll check out the milestones which I have passed through my humble 3 decades of living. Memories that lives with the people whom you’ve grown up with, the grandma stories which your parents and kindergarden/primary school mates tell you, of how you were the naughtiest girl/boy in school.. Then comes the old photos stock that your family keeps of you.. and those few that you have scattered somewhere in your house.. Then comes the small scar which you used to show off to friends while sharing how ‘heroic’ you being able to withstand the fall, and went home without telling your parents.. Oh LOL.. I went home with two ‘horns’ bruises bulging out from my forehead. Thought I could conceal them by applying Vicks on my fringe. Unfortunately the tactic didn’t work as my mum noticed it too soon. I had to admit that some boys were throwing stones at each other and I got struck by not 1, but 2 stones. Thank you St Johnians. Those were some hard powered memories I shan’t forget for the rest of my life. 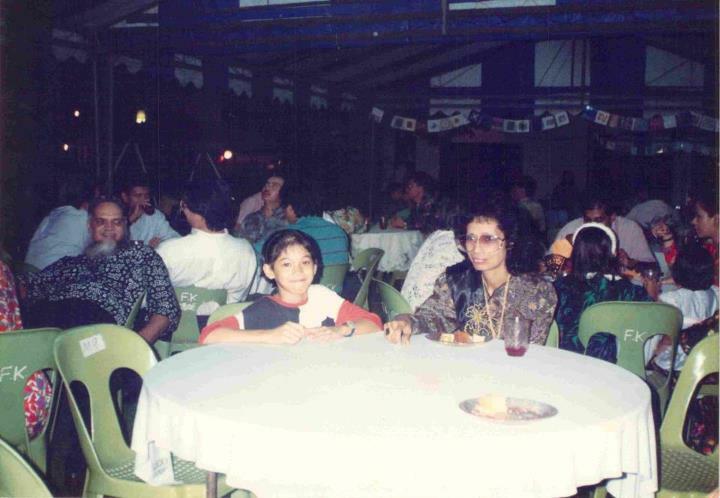 The little rascal right there with her tuition teacher circa 1991-1992.. mmg retro betul my teacher kan..? (apparently she is also related to me, and came for my wedding earlier this year !). And yes, I am a CBNer through and through. Fast forward 16 years later.. 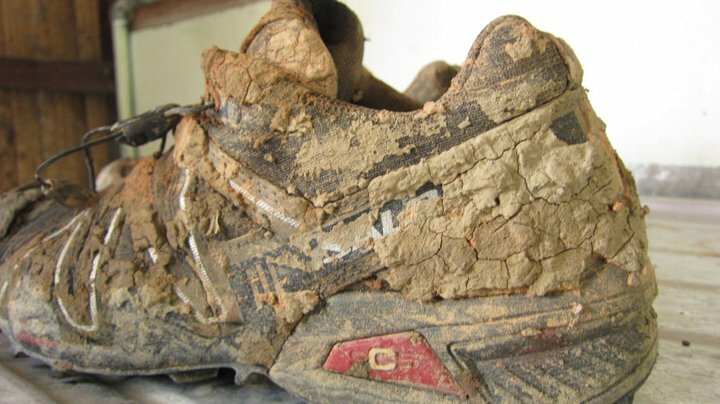 It was my triathlon and multisports heyday (and not ‘hayday’ <<– so I just found out !).. I have had the time of my life ! No seriously, my journey through these few years being involved in triathlon had been nothing but incredible. I would not say my family supported me 100% as I was also studying the first few years. Nevertheless, I made it through both, alhamdulilllah. My maiden Ironman (and only 1 so far) was completed a year before I graduated. Fast forward to 2012, the record has yet to be broken. Just 1 Ironman, and no biggie about it. 13hrs 42mins, with a 5hr 10mins marathon within that. Garu kepala jugak fikir2 balik, how da heck did I do that. Nak seribu daya, tak nak seribu dalih. To go for such distances, one has to be humble. H.U.M.B.L.E. If tak faham omputeh, its called ‘rendah diri’. Respect the sports, the game and the people who’ve completed them. I learnt it my own personal way… I did not ”announce” then ‘Hey I am doing Ironman !’.. or 1/2 IM.. I took it my own pace (and patience) to go through the series of distance before I was physically and mentally ‘matured’ enough for this might of an event. 2007 was my sprint tri – year. 2008, on to OD. 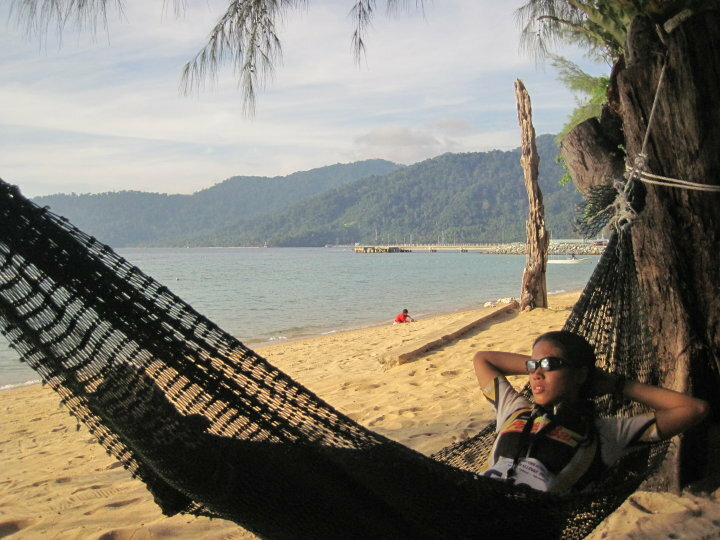 End of 2008, did my first half-Ironman distance in Desaru, and walla, 2009, Feb 28 — IM Langkawi. I can’t describe in typed words how I felt crossing. But if I can numb-ly put it.. it was ‘Now what?’. I took a step back.. and wondered, napa pulak la macam blur ni.. am I suppose to jump in joy, or tears..? I did none of that. 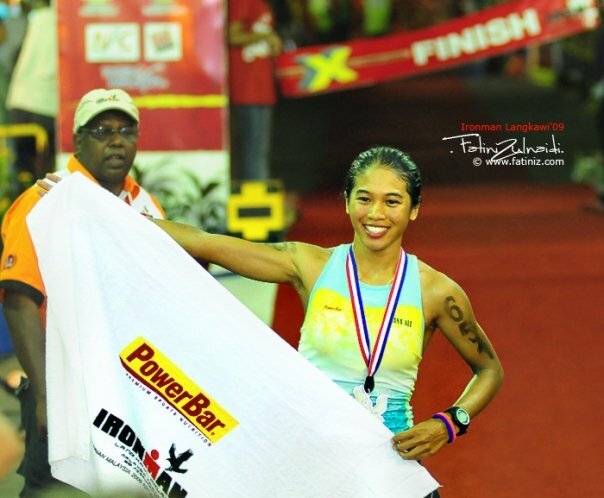 Smiled for the camera while posing with the Powerbar towel, and IM medal. It was all about the journey, in the end, that matters. The journey to, as well as journey through. My milestones are set by my journeys, and not necessarily the destinations. But this one was an exception.. both the journey and destination was a big deal. 🙂 Tioman oh Tioman. Its the beauty… bukan black beauty.. So to all of you embarking on running, or any kind of multi-sports, please, please, savour every moment of it. Talking big, or showing off whatever you need to show off just takes the beauty of your experience/journey away. Be true and sincere to yourself even if you think that running a PB every time you run, and being able to go on the podium slash beat your training rival is all that you care. If I care the same, I would have listed all my races, how many medals I have had etc. Tapi buat apa kan, bazir masa je. 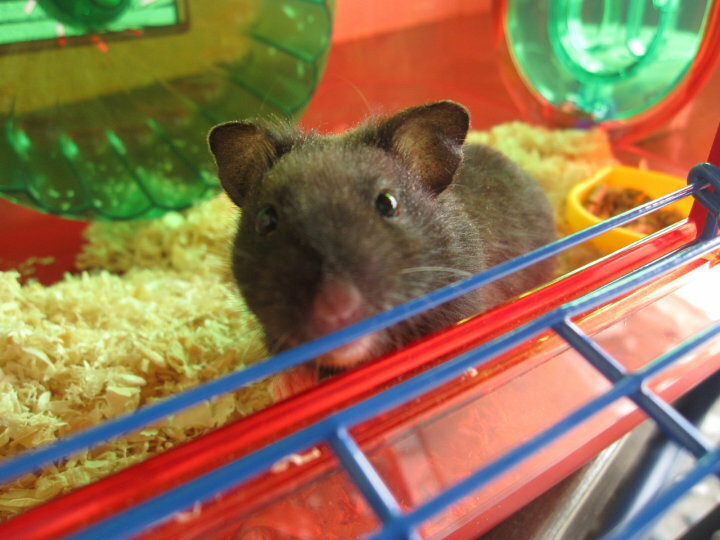 My Rita which ran away.. my black Syrian hamster which manage to bite its way through the metal cage. Truly, I had the time of life doing triathlons and other sporting events for the past few odd years. (and will continue to do so,insyaAllah) It was made even more meaningful by the beautiful people and souls which I’ve passed along, including those who have passed on.. The late Ngae, TSB, and many more.. To all who’ve given me the inspiration to do better, and challenge myself to achieve the impossible, thank you. Salah silap tolong maafkan. Halalkan semua makan minum. Aku bukan nak gi mana ni.. nak gi tido dah coz already 11.30pm. Esok gotta wake up early coz ada program HKL. Then at night, ada Larian Bentuk (Shape Run da..). And plenty of rest time in between. Okay? bak kata Zulhassan, larian geli-geli. So wa pon nak lari geli2 malam esok with the rest of ya. Whoever is going, insyaAllah, see you there ! Sesiapa pergi Ipoh Century Ride (dan menyempat lagi singgah missjewelz.worpress), good luck ye. Sapu sunblock banyak sikit. 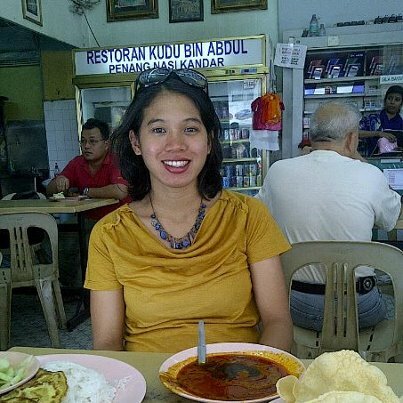 Photo taken this afternoon (12/7) during lunch break with Jaja @ kak Pah at the 1 and only Kudu ! Thanks Stupe. Im touched.You’ve been a great friend and brother. 🙂 Best wishes to you too 🙂 Thank you, thank you.